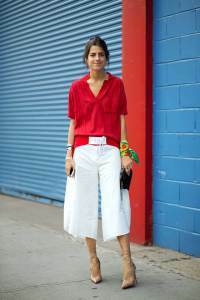 NYFW Spring 2015 – Street Style – Milieu de la Moda, Inc.
Street style is my absolute favorite part of NYFW. So much diversity and uniqueness is seen on the streets of any major fashion capitol. Which makes narrowing down my favorite looks VERY hard. All my favorite fashion bloggers are in the same place and even snap a few pictures together, making instagram my go-to app for the week. Some of favorite fashion bloggers are pictured above, Leandra Medine(Man Repeller), Jamie Chung(what the Chung), and Nicole Warne(Gary Pepper Girl). Also pictured is Olivia Palermo, Gala Gonzales, and Miroslava Duma(showing us how to make pregnancy chic). Enjoy the beauty of these photos!! ❤️ this! Digging all the high waisted skirts!